Mikheil Saakashvili, in a speech to the Parliamentary Assembly of the Council of Europe (PACE) yesterday, pledged to bolster Georgia’s fledgling democracy as he seeks to both improve ties with Moscow and continue the country’s bid for NATO membership. The newly-reelected Georgian president faced some resistance to reaching the podium in Strasbourg, when the Russian PACE delegation objected to the body welcoming a political leader months away from a key parliamentary election. Allowing him to speak amounted to an endorsement of Saakashvili, the Russian delegation unsuccessfully argued. “I am especially grateful that the doors to this assembly are open both during our triumphant times and our more turbulent ones,” Saakashvili said in his opening remarks, according to a pre-released transcript of his address. Local and international observer groups deemed the vote broadly fair, but documented many serious irregularities. All six opposition candidates claim the election was rigged to hand Saakashvili a victory without a runoff. Saakashvili pledged his government would take seriously the violations documented during the presidential campaign and election. The spring parliamentary elections, he said, would be “another step forward” for Georgia’s developing democracy. His campaign’s abuse of administrative resources was widely condemned by election watchdogs. Saakashvili, who is beginning his final five-year term, spoke of his government’s successes since taking power but acknowledged the challenges ahead, particularly the struggle to alleviate Georgia’s poverty. 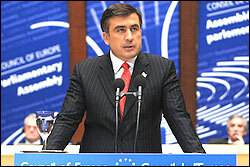 Saakashvili, who has promised with varying degrees of certitude to regain South Ossetia and Abkhazia within his last term as president, spoke about “systematic abuses of human rights” in the separatist enclaves, drawing the assembly’s attention to the plight of hundreds of thousands of refugees from those secessionist wars. In addressing relations with Moscow, he repeated a line from his January 20 inauguration speech calling for Georgia’s borders to be bridges rather than barriers to neighborly relations. “[We want] bridges to the north, the south, the east, and west,” he said, but added that “Georgia is forever yoked to Europe.” The country can continue its path to Euro-Atlantic and NATO integration, Saakashvili suggested, while still maintaining good relations with Russia.